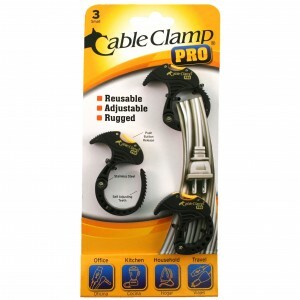 The Cable Clamp PRO® is the ultimate Reusable Cable Management Tool. Featuring a unique Push Button Release constructed with flexible and durable polycarbonate. Integrally attached Carry Handle serrated for easy grip. 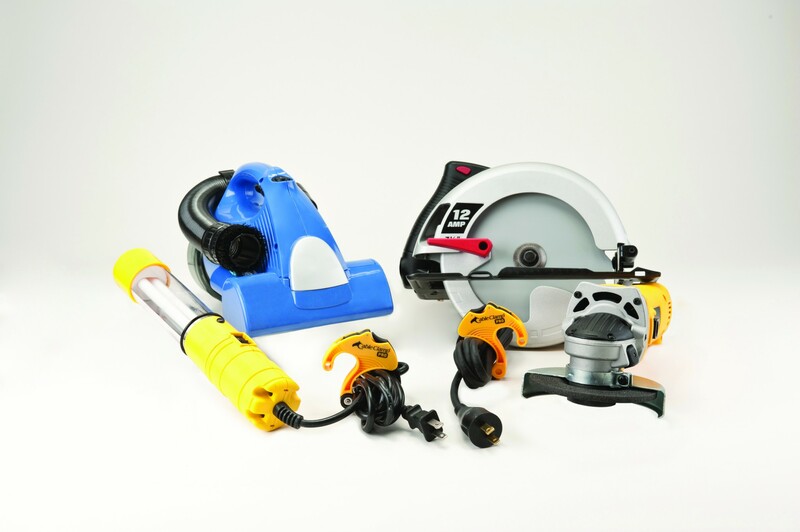 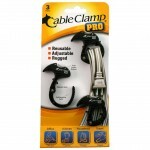 Carry handle also includes built-in lanyard hole allowing for attachment of rope, wire, or hook. 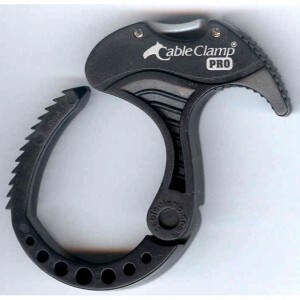 Lanyard hole maybe used for tethering of Cable Clamp PRO® to cords, cable and other devices. 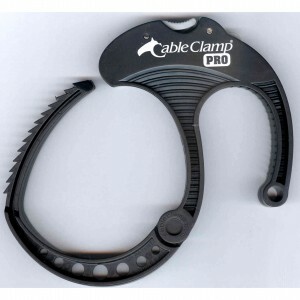 The integrally attached Pop-Up Peg Hook D-Ring is easily deployed. 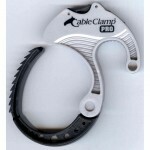 D-Ring constructed of high tensile spring steel and polished to stainless steel sheen. 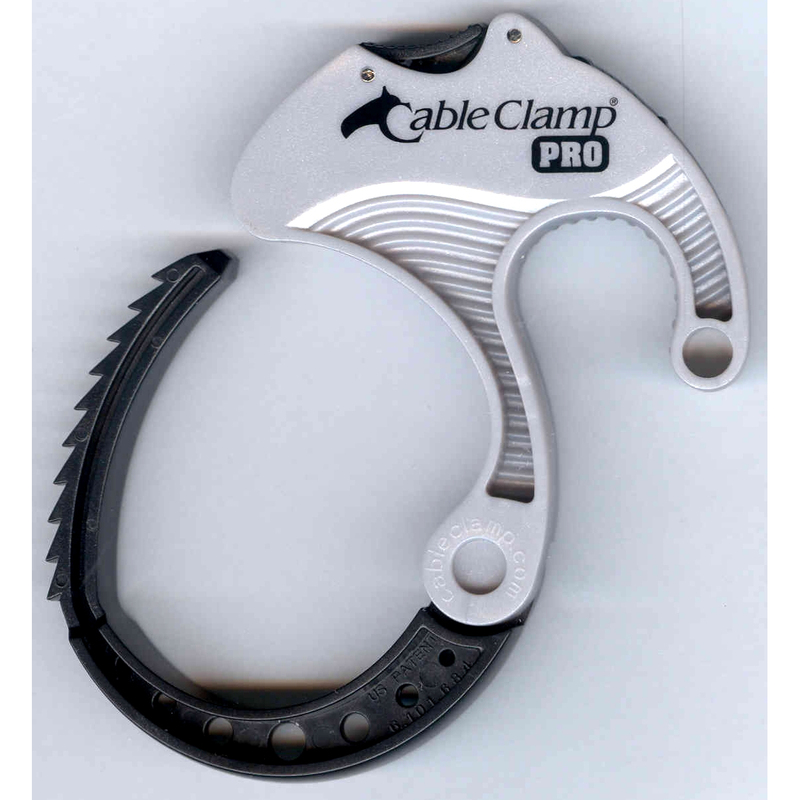 Patented hinge operation and self-aligning teethed jaws automatically hold multiple open positions without the hassle of some existing cable management products. 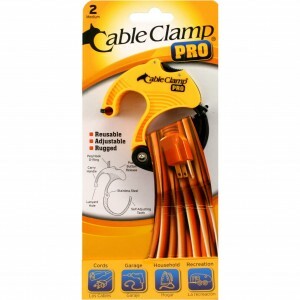 The Cable Clamp PRO® lays flat for efficient handling and storage. 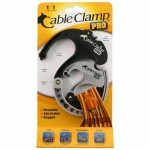 It incorporates a unique 360-degree footprint accentuated with multiple round spheres and curved serrations. All succeed in creating a visually and physical feeling of continuity, comfort and functionality. Reusable Cable Clamp PROs® replace one-time use cable and cord management devices conserving natural resources. 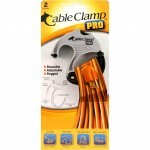 Constructed with Polycarbonate/ABS polymers and Stainless/Spring Steels. 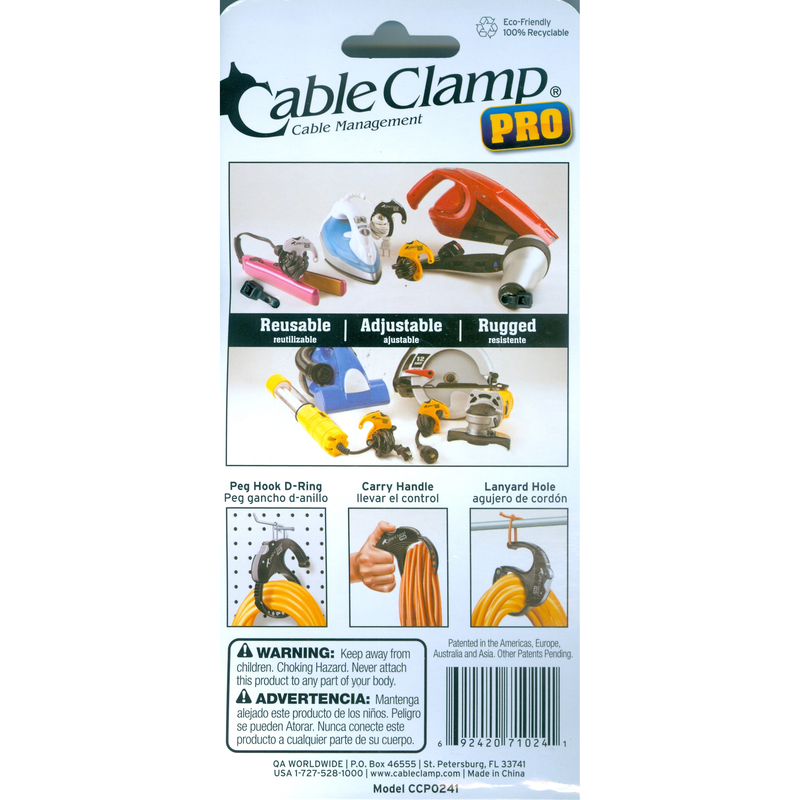 Reusable, Adjustable, Rugged, and Easy-To-Use. 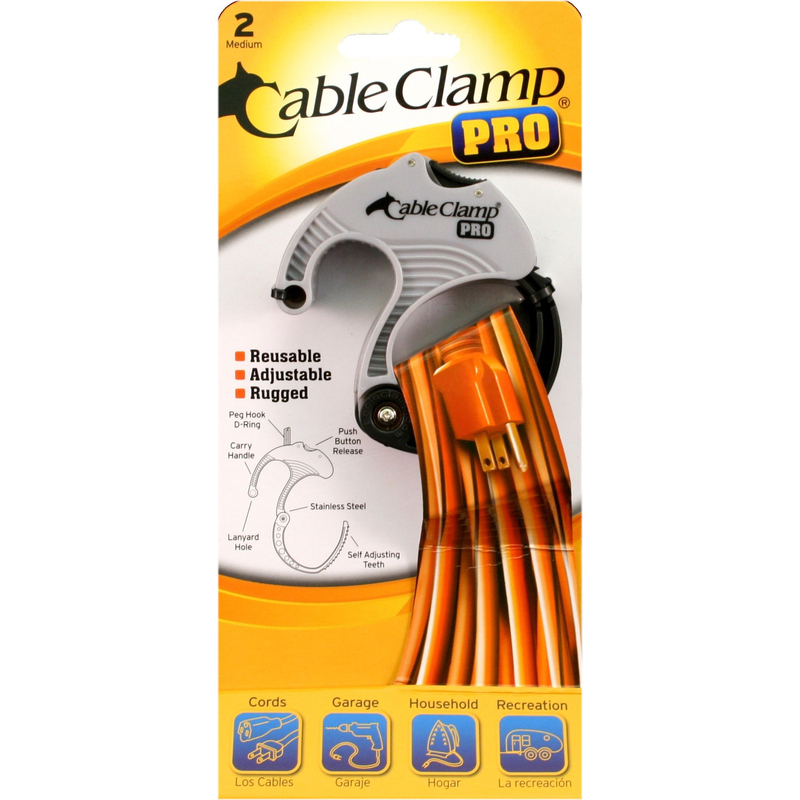 The medium Cable Clamp PRO® is for bundles up to 2-Inch. 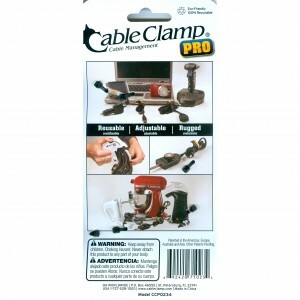 Carded Pack includes 2 medium platinum/black Cable Clamp PROs®. 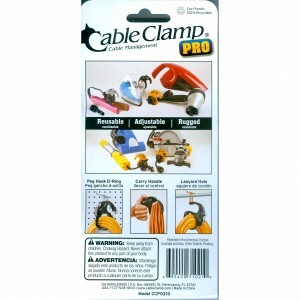 Available in cartons with 12 packs. 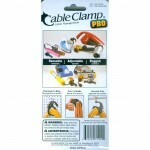 Pack Dimensions: 4″ Width, 8.5″ Height, 1.1″ Depth.